"Kick Gas Lawn Care is THE way to go for a beautiful, healthy AND eco-friendly lawn!" Grass Cutting in Mississauga can be performed without tapping into our power grid. With a little innovation and a desire to protect our natural resources, we can help keep Mississauga green. At Kick Gas Lawn Care, we live by our environmental principles by caring for lawns throughout Mississauga using emission free and organic techniques. We believe having a beautiful, lush, green lawn should not come at the expense of our air, soil and water. Solar energy is the way of the future. We harness solar power with panels on top of our trailer and use lithium ion battery equipment to operate off the power grid and completely emission free. Battery powered equipment has made incredible progress over the past few years. It is quiet, efficient and emission free. Mississauga Lawn Care companies are reluctant to change how they operate. Kick Gas Lawn Care is setting a new standard in lawn care and encourages others to see the value in using sustainable energy as opposed to gas. According to the Government of Canada, a gas powered lawn mower emits 106 pounds of greenhouses gases every season. Due to their inefficient design, gas powered yard tools are a serious contributor to air pollution. In fact, in a study by the Ministry of Environment Canada – they found that operating a gas powered lawn mower for one hour has the potential to produce the same amount of VOCs, NOx, CO – all components of smog – as driving a new car for 550 km! As of 2006, two thirds of all Canadians owned a gas powered lawn mower. Unfortunately, operating gas powered lawn care tools negatively impacts the Earth’s ground level ozone. Ground level ozone is formed when emissions from gas powered machines both on the road and in your backyard react with heat and sunlight. During the height of the summer, ground level ozone levels become harmful to everyone’s health. Those with pre-existing respiratory problems, as well as older adults, and younger children are particularly susceptible to the negative effects of ground level ozone. The health of your soil is also affected. While most lawn care techniques, such as seasonal fertilizing, amending with lime, and overseeding are beneficial practices, spilled fuel is not. Over the course of a lawn care season, gas powered lawn mowers require constant refuelling, and sometimes it gets spilled. This fuel soaks in affecting the health of your lawn, and causing adverse effects on groundwater. By running on electricity as opposed to gas, the sounds, smells, and negative environmental impact usually associated with lawn care don’t apply to Kick Gas Lawn Care. It’s true what they say about necessity being the mother of all invention. Finding alternative energy sources is just as important on your front lawn as it is in your driveway. That’s why we started Kick Gas Lawn Care. We are proud to be Mississauga’s first totally off the grid lawn care provider. Our efforts have not gone unnoticed. In 2015 Kick Gas Lawn Care was a finalist in the Mississauga Business Awards of Excellence for the Clean and Green category. We are committed to our vision of eliminating the use of gas powered, two stroke engines for lawn care practices. Grass Cutting in Mississauga has taken a new turn. We provide the service. Now, it’s up to consumers to make the right choice. For those of you that enjoy taking care of your lawn, and don’t require a Lawn Care Mississauga Service, you can still practice sustainable lawn care. Try using electric equipment. There are many brands our there with competitive prices. Most of these brands have interchangeable batteries, so you can switch them from tool to tool. No cords, less noise and no gas. Some mowers can handle over 10,000 square feet on a single charge, so people with larger properties can still choose this option. Learn More here. Use organic lawn fertilizers and mulch your grass clippings. Organic fertilizers are made from natural ingredients and break down slowly. Mulching your grass clippings back onto the lawn adds extra nitrogen and organic matter. Keep your grass longer. Taller grass tends to have fewer weeds. Mow your grass to the optimal 3 inch height and you will see results. Choose the right grass types for you lawn and over seed in the fall. If you have sun in the front and shade in the back, use the appropriate seed type for that growing environment. Overseeding in the fall keeps your grass thick and weed free. Sometimes, no matter what you do, grass just doesn’t seem to grow well. In this case, you need a soil analysis. This analysis will give you a breakdown of your soils strengths and weaknesses, as well as the ph level. You may need to amend your soil. Some may not be comfortable doing this. 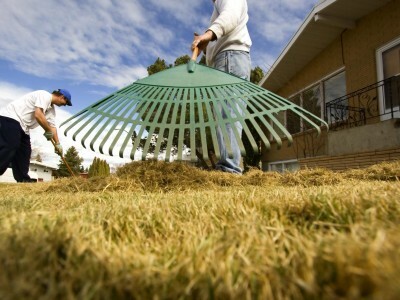 Our Lawn Care Service Mississauga staff can help. Keep pesticide and herbicide use to a minimum. We feel they should not be used at all, but if you must, only do this when necessary. These chemicals destroy the natural environment and pollute our water. Preventive measures are the key to eliminating the use of these harmful substances. Use 5 parts white vinegar, two parts water and one part dish soap to spot treat weeds. Keep your mower blades sharp. This ensures the grass is cut and not torn. Greatly reducing stress and healing time. Compost your kitchen and yard waste. You can create your own nutrient rich compost to top dress your lawn with. This beats any fertilizer hands down and saves you money. Control thatch. Thatch is a build up or organic matter that is slow to decompose. This layer holds in moisture that attracts pests and disease. You can remove this by raking the surface of your lawn vigorously. This is labour intensive, but worthwhile if you don’t mind the exercise. Water infrequently, but deeply. This will create stronger root systems that grow deep into the earth. Water in the morning. Watering in the afternoon can burn your grass and most of the water will evaporate before the grass gets a chance to use it. Practise these 10 Tips for Sustainable Lawn Care and you will have a green, healthy organic lawn without the use of chemicals and herbicides. Organic Lawn Care in Mississauga is attainable if you make the right choices.